The Goldilocks period of a perfect rising trend appears to be over, and the uptrend of the Straits Times Index has been broken. As to how far down the STI can go, the 200-day moving average -- remarkably still intact -- is at 3,328, and is as good a guide as any. Unfortunately, any rebound off this level is unlikely to prevent a breakdown below the moving average. Quarterly momentum is in steep retreat, and has just broken below its equilibrium line. The chart pattern shows the STI breaking below a broadening formation, a typical chart pattern at the top of bull markets. The breakdown level is at 3,400, with the breakdown indicating a target of 3,100. Volume expanded as prices fell, confirming a change in trend. This will not be a one-way move. The market is likely to decline progressively, in a series of peaks and trough, with each peak lower than the previous peak, and each trough lower than the previous trough. The immediate resistance is at 3,400. The 21-day RSI is at 38 and has room to fall. 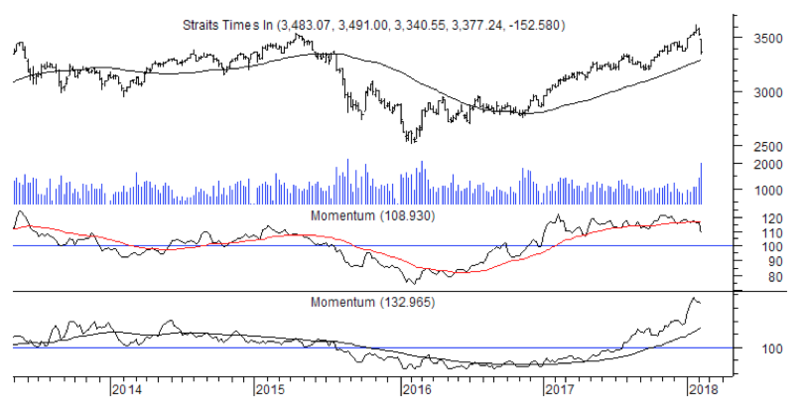 Annual momentum has broken down after a series of negative divergences suggesting that an all round weaker phase lies ahead, and could persist for months.